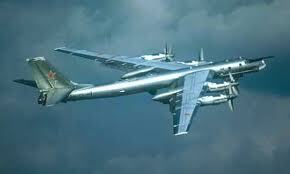 Today's story about two Russian military TU-95 Bear bombers flying within 56 kilometres of Canadian soil, just when the House of Commons defence committee is getting ready to examine the government's single-bid purchase of the new generation of F-35 Joint Strike Fighters, makes it look like the Tories are trying to manufacture an excuse for $16 billion dollars worth of spending. Aiming your jets at someone else's airspace and veering off before you cross it is an old Cold War style game. A way of testing response time and seeing if the other side is awake. This is the second time in the last few weeks that this has taken place and both times the news articles took the time to note that this is a not uncommon occurrence -- four bombers have been intercepted this year, and it happened sixteen times last year. That it happens while the three countries that are competing for Arctic riches with the Russians are engaging in military exercises -- Canadian, American and Danish warships are in the final week of a joint exercise in the Canadian Arctic, part of an annual event known as Operation Nanook -- makes the affair even less surprising. Of course the Tories would have you believe this is proof that they needed to buy sole-sourced jets at a cost of $16 billion instead of just a routine "buzzing." Canada no doubt needs an upgrade in its defense forces, the question people want the answer to is why were there no competing bids?